Doomfist, the name of a long-lost Disturbed album and probably also a villain in season 57 of Power Rangers, is today’s big Overwatch discussion topic. Some suspect that he’s gonna be a playable hero soon, but he’s technically been present in the game since day one. In Overwatch lore, Doomfist is actually a title, rather than the name of a single hero. At least three people have been Doomfist at some point or another, all of them aided by a powerful gauntlet that presumably made their fists significantly doomier than your average lump of meat and bones. Blizzard actually dropped the first reference to Doomfist before Overwatch was even out. The gauntlet Widowmaker and Reaper were trying to steal in the game’s reveal cinematic belonged to the Doomfist lineage. 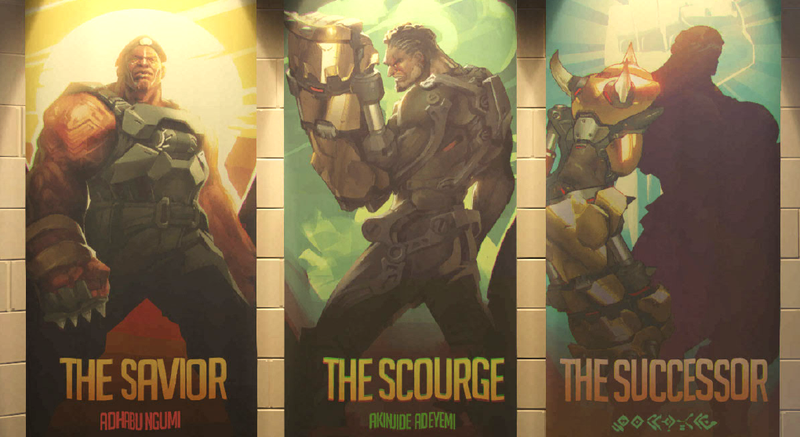 There are also movie posters of various Doomfist incarnations on Overwatch’s Hollywood level, and the gizmo affixed to the payload on Numbani is, again, Doomfist’s titular fist of doom. So, why all the hubbub today? Basically, Blizzard released a new Overwatch PTR patch yesterday, and intrepid dataminers found a new asset for the aforementioned Numbani payload. The Doomfist gauntlet pod is still there, but it’s broken, suggesting that somebody snatched it. Is this the origin story of a new Doomfist? Sure sounds like it, but there’s no telling what Blizzard is actually up to. There’s more to all the recent Doomfist-related rumblings, though. Terry Crews—yes, the pulsating ball of muscles and yells from Old Spice commercials—has expressed interest in voicing Doomfist, going so far as to release an audition video and receive an endorsement from Rock “The Dwayne” Johnson. He even got to visit Blizzard’s headquarters, which could lead to something... or nothing at all! Maybe Blizzard just saw an opportunity to have a celebrity come visit their studio and took it. Free mainstream promotion is free mainstream promotion after all, even for a game as popular as Overwatch. At any rate, it sure seems like Blizzard is hinting at something. They like to make events of hero releases, and we’re about due for one. Here’s hoping this whole thing ends up being a bit more, you know, straightforward than the last big hero reveal. If Terry Crews really is involved, I hope Doomfist just suddenly explodes into the game one day, with two smaller versions of himself for biceps, both screaming about armpit fragrance.